A new map combining nearly three months of data from NASA's Fermi Gamma-ray Space Telescope is giving astronomers an unprecedented look at the high-energy cosmos. To Fermi's "eyes", the universe is ablaze with gamma rays from sources within the solar system to galaxies billions of light-years away. A paper describing the 205 brightest sources the LAT sees has been submitted to The Astrophysical Journal Supplement. "This is the mission's first major science product, and it's a big step toward producing our first source catalog later this year," said David Thompson, a Fermi deputy project scientist at NASA's Goddard Space Flight Center in Greenbelt, Md. The LAT scans the entire sky every three hours when operating in survey mode, which is occupying most of the telescope's observing time during Fermi's first year of operations. These snapshots let scientists monitor rapidly changing sources. The map includes one object familiar to everyone: the sun. "Because the sun appears to move against the background sky, it produces a faint arc across the upper right of the map," Michelson explained. During the next few years, as solar activity increases, scientists expect the sun to produce growing numbers of high-energy flares. "No other instrument will be able to observe solar flares in the LAT's energy range," he said. To better show individual sources, the new map was processed to suppress emissions from gas in the plane of our galaxy, the Milky Way. The top sources within our galaxy include the sun; a star system known as LSI +61 303, which pairs a massive normal star with a superdense neutron star; PSR J1836+5925, which is one of many new pulsars, a type of spinning neutron star that emits gamma-ray beams; and the globular cluster 47 Tucanae, a sphere of ancient stars 15,000 light-years away. 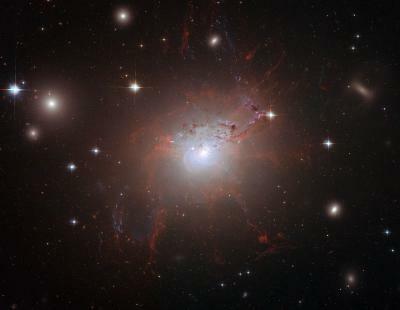 Top extragalactic sources include NGC 1275, a galaxy that lies 225 million light-years away and is known for intense radio emissions; the dramatically flaring active galaxies 3C 454.3 and PKS 1502+106, both more than 6 billion light-years away; and PKS 0727-115, which is thought to be a type of active galaxy called a quasar. As a way of underscoring the variety of the objects the LAT is seeing, here is a "Top 10" list comprising five sources within the Milky Way and five beyond our galaxy. The top ten also includes two sources -- one within the Milky Way plane and one beyond it -- that researchers have yet to identify. 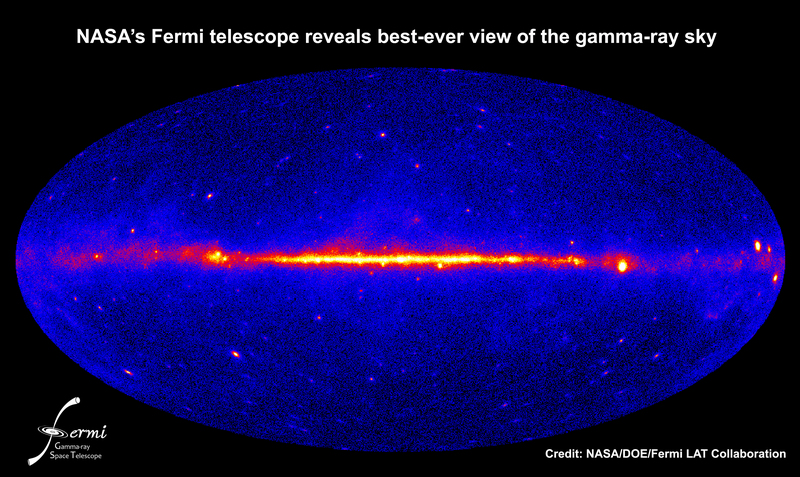 More than 30 of the brightest gamma-ray sources have no obvious counterparts at other wavelengths. "That's good news. It means we're seeing new objects," Michelson said. "It also means that we have lots of work to do."